Back in March, Google Maps added a dedicated ride-sharing tab with comparative prices. This is extremely useful if you want to compare prices easily, and of course to see what services are available in a given area. 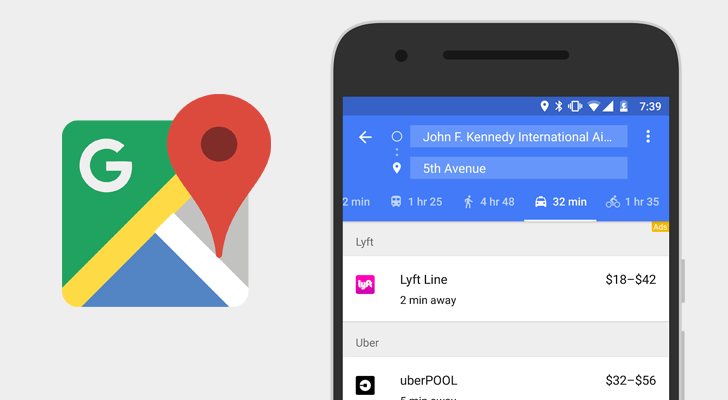 Today, Google is improving that feature by adding support for Lyft and Gett. Google claims Maps now displays options from "9 ride-sharing partners in over 60 countries." Google also mentions that the ride-sharing tab shows multiple types of services offered by each company. For example, Lyft may also show a Lyft Line ride as an option. Google says that options from Lyft will show up all across the United States, while Gett will be limited to New York City (which is to be expected, as Gett is exclusive to that city).